Sueding up for Spring/Summer 2016 season. Yes, suede is still going strong. But in more casual appearance, so to say. Not that much fringe, but rather simple lines or tricky forms. If we are to speak of suede styles involved this upcoming season, then it's primarily all about ethnics and minimalism. We can't also deny the power of daring femininity with retro twist showcased by Balmain and Olivier Rousteing. Yet the most interesting way to divide suede of Spring/Summer is according to colors. In other words, neutrals and colors. Neutral suede was seen quite widely at Alberta Ferretti and Rebecca Minkoff, while splash of colors was seen in full blossom, literally, at Balmain and Jonathan Saunders. Suedely suede in full suedeness... And what type of suede are you? Neutral sueded pieces are a sort of modern day classics. Yeap, you heard me right. Not quite sure for how long suede will be able to keep its fashion title, but you better invest in a neutral colored piece. It will work literally with every kind of outfit, as well as popping colors. So pay attention to blacks, whites, browns, beiges and greys. In contrast to neutrals colored suede pieces are a much more risky investment. Still we all believe Spring/Summer season is made for popping, life-ful colors, right? So one, or two (or more), will never harm no body. Plus such a bombastic piece can become pretty much a statement character of your outfit. Right. What about suede-d details? No worries there's a number to choose from. 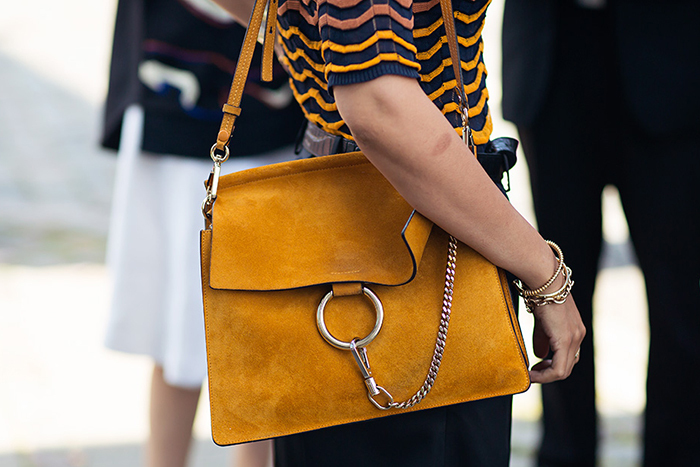 Designers did upgrade our favorite bag styles with suede, and even prints. Suede shoes are also still counted as serious footwear players. Oh, and don't forget about less statement details - wide waist belts and long gloves. Because devil is in the... sure you know this saying.